For a total of 23 weeks, Jennifer Kupcho has found herself ranked first in the Women’s World Amateur Golf Rankings. 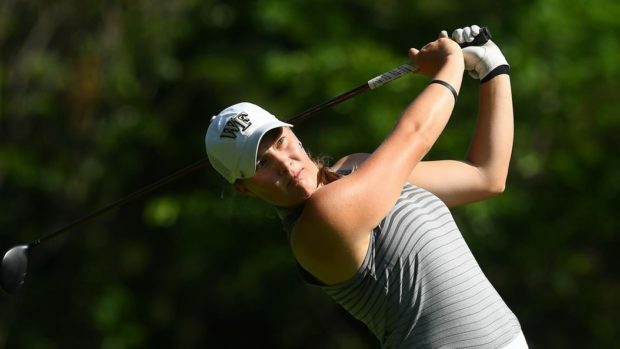 But the Wake Forest University senior from Westminster, Colo., hadn’t finished atop the leaderboard in an individual tournament since she won the national title at the 2018 NCAA Championships last May. Did that ever change during last weekend’s 75-player Tar Heel Classic in the Dominican Republic. Kupcho didn’t just win. She dominated the Teeth of the Dog Course at Casa de Campo, a Pete Dye layout ranked 27th on Golf Digest’s list of the World’s 100 Greatest Courses. Kupcho carded a 14-under-par 202, nine shots clear of her closest competitor in the three-day event. She came out of the gate with birdies on the first six holes, and added 11 more and an eagle on the next 48. Her Demon Deacons teammates combined to finish 9-under, with the team’s 23-under-par total a school record for a 54-hole event. 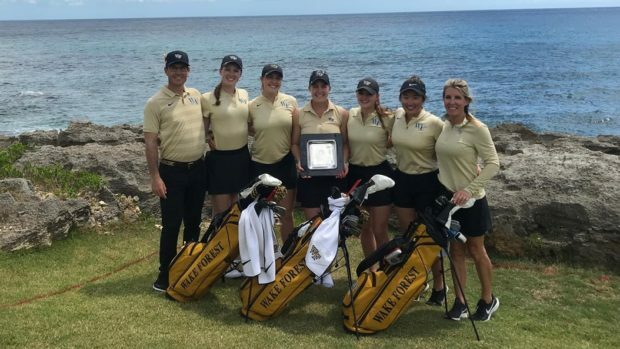 Kupcho, center, with her victorious Demon Deacons teammates at Casa de Campo. In fairness, Kupcho’s individual victory “drought” consisted of playing on the winning U.S. teams in the Curtis Cup, Palmer Cup and World Amateur Team Championships (where she individually came in second in the elite field). She also finished 16th in the LPGA’s Marathon Classic and runner-up in the eight-round LPGA Qualifying School, easily earning her professional card. She will turn professional after this May’s NCAAs. Her recent play shows she may be peaking at just the right time, finishing her amateur career with a flurry. The week before her victory in the Dominican Republic, she came in second out of 90 players in the Darius Rucker Intercollegiate. Kupcho’s victory marked her eighth in 39 collegiate starts. Her final three tournaments will be the Bryan Invitational (March 29-31), which she won last year; the ACC Championships (April 18-20); and the NCAAs (May 6-8), where she’ll look to defend her title. She’ll also compete as a favorite in the inaugural Augusta National Women’s Amateur April 3-6. Then it’s onto the U.S. Women’s Open (May 30-June 3), her first event as a professional.